A 60-day comment period will allow stakeholders the opportunity to chime in on a proposed flexible sleeper berth pilot program. The Federal Motor Carrier Safety Administration (FMCSA) is seeking approval from the Office of Management and Budget (OMB) for the information it wishes to collect during the study. As a part of the OMB approval process, FMCSA must solicit public comments from interested parties. Under the proposed pilot program, FMCSA will allow temporary regulatory relief from its sleeper berth regulation for a limited number of CDL (commercial driver's license) holders who regularly use a sleeper berth to accumulate their required 10 hours of non-duty work status. During the study, participating drivers would have the option to split their sleeper berth time within parameters specified by FMCSA. Driver metrics would be monitored, and safety performance and fatigue levels would be analyzed. This pilot program seeks to produce statistically reliable evidence on the question as to whether split sleeper berth time affects driver safety performance and fatigue levels. Electronic logging device (ELD) data, to evaluate duty hours and timing, driving hours and timing, rest breaks, off-duty time, and restart breaks. Onboard monitoring system (OBMS) data, to evaluate driving behaviors, safety-critical events (e.g., crashes, near-crashes, and other safety-related events), reaction time, fatigue, lane deviations, and traffic density, road curvature, and speed variability. Roadside violation data (from carriers and drivers), including vehicle, duty status, hazardous materials, and cargo-related violations (contingent upon inspections). The data collection plan for this pilot program is subject to change based on comments to the docket and further review by analysts. Whether the proposed collection is necessary for the performance of FMCSA's functions. The accuracy of the estimated burden. Ways for FMCSA to enhance the quality, usefulness, and clarity of the collected information. Ways that the burden could be minimized without reducing the quality of the collected information. Whether the data collection efforts proposed for carriers and drivers are burdensome enough to discourage their participation. How data collection efforts should differ for team drivers. Federal eRulemaking Portal. Follow the online instructions for submitting comments. Mail: Docket Operations, U.S. Department of Transportation, 1200 New Jersey Ave. SE., West Building, Ground Floor, Room W12-140, Washington, DC 20590-0001. Hand Delivery or Courier: 1200 New Jersey Avenue SE., West Building, Ground Floor, Room W12-140, Washington, DC 20590 between 9 a.m. and 5 p.m., Monday through Friday, except federal holidays. Comments must be received on or before August 28, 2017. 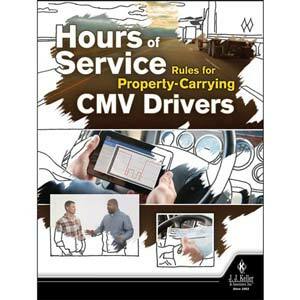 J. J. Keller's Hours of Service Rules for Property-Carrying CMV Drivers Training addresses the current hours of service rules and includes critical information regarding the ELD mandate.